The two gray squirrels look like they’re training for the space program, but instead they’re just nuts. Nuts for coconuts, that is! 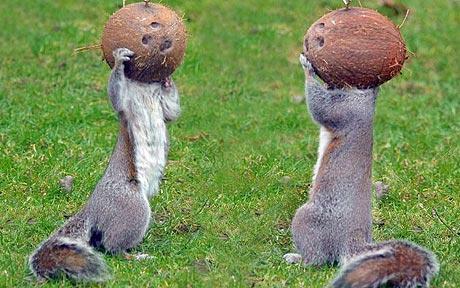 Jane Roberts of Fareham, Hants, in Great Britain is treated to the wonderful spectacle of squirrels with coconuts on their heads every day in her backyard. She puts out two coconuts with holes cut in them for the local wildlife, and the squirrels show up day after day to pop their heads in the coconuts and eat out the delicious meat inside.